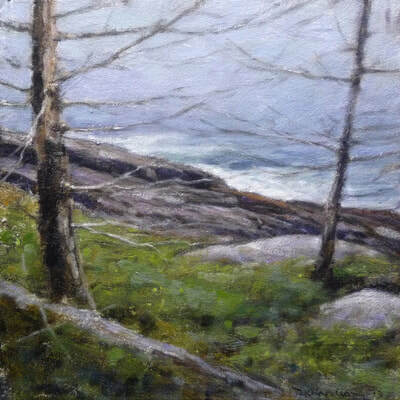 As an artist, I am captivated by the land with all its power, mystery, and poetic implications. I am drawn to subjects and locales that, for me, contain much more than simply a view. Indeed it is my goal as a painter to express the energy of a place as opposed to its physical reality. Aesthetically, I am often drawn to multi-layered surfaces. My underpaintings may include accidental marks or even the ghost of an earlier idea or composition, which, through the creative process, may be brought forward to play a role in the final image. I am fascinated by the beauty and truth within personal marks and gestures made simply as a thumbnail sketch. As I paint, I seek both to maintain and develop this authenticity. 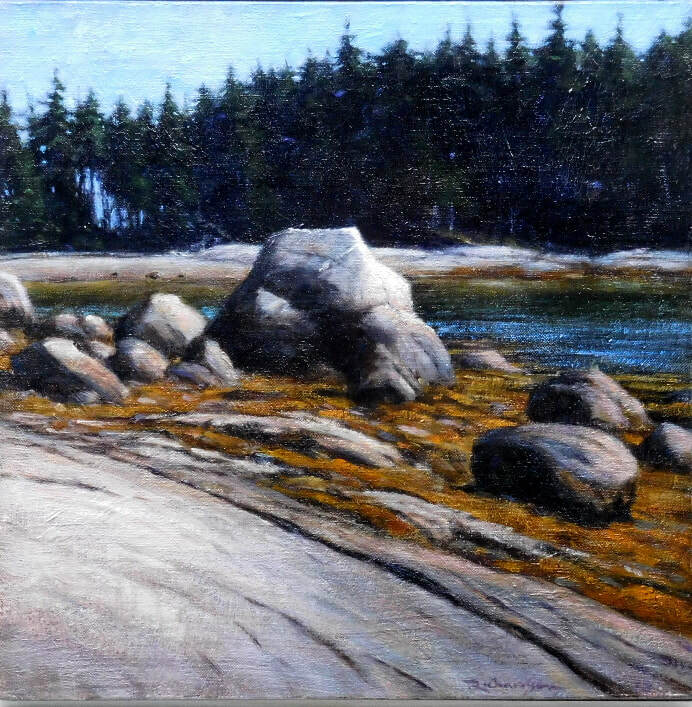 After twenty years painting on the coast of Maine, I continue to be inspired by our state’s unique beauty, as well as our rich tradition and significant history in American art. 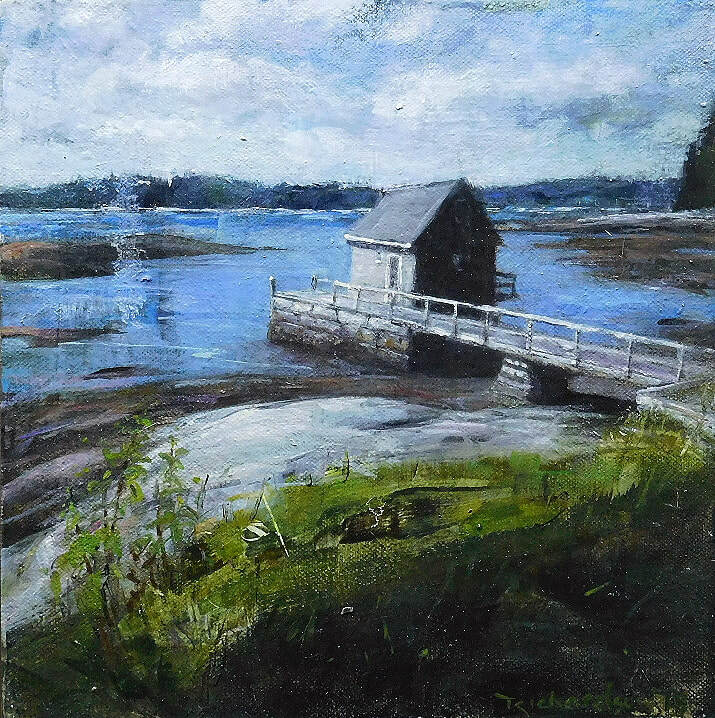 Born in Connecticut into a family of artists, musicians, and dancers, Alec Richardson spent every summer at his grandparents’ property on Spruce Point in Boothbay Harbor. 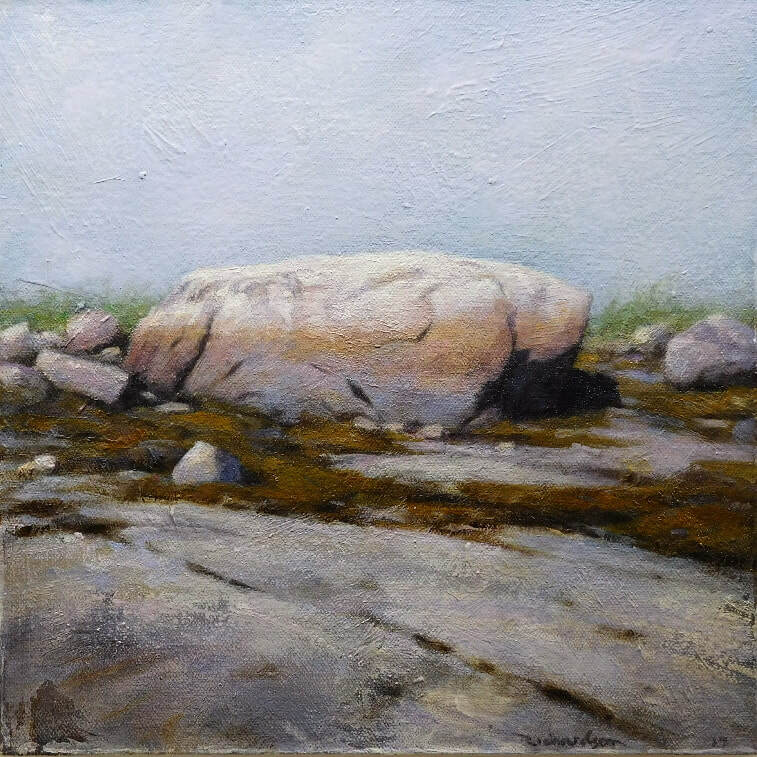 When choosing an art school, he decided on the University of Maine in Orono, where James Linehan was one of his teachers. Richardson’s paintings have been included in group shows throughout Maine as well as New Hampshire and Connecticut. 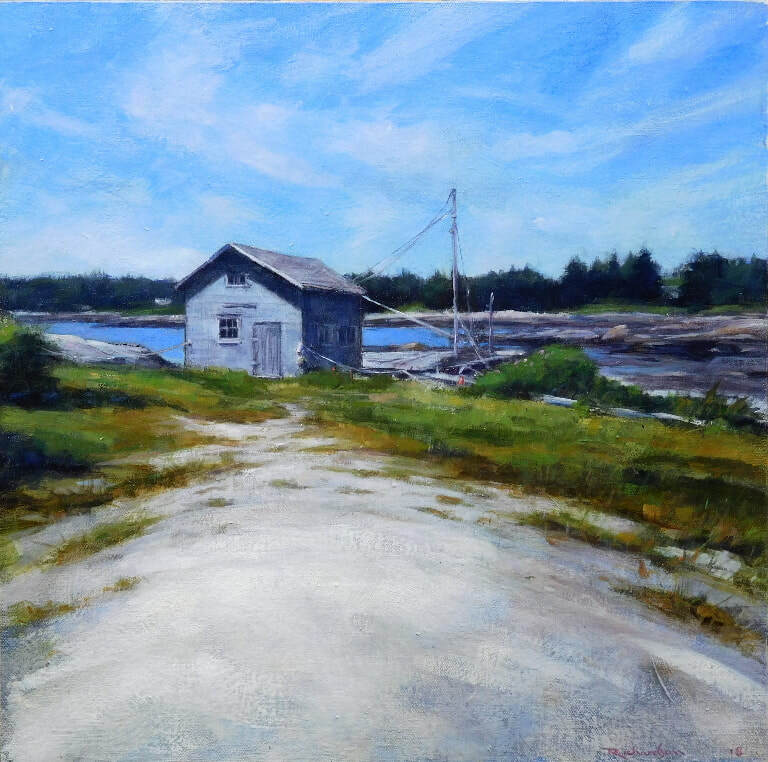 He is represented by Greenhut Galleries in Portland, where he has had six solo shows, and is now also affiliated with Littlefield Gallery in Winter Harbor, where he will have a solo show in July of next year. Invention has played a variously strong role in Alec Richardson’s landscapes, and so has the amount of descriptive detail he includes. Consequently, his style has ranged from more tightly descriptive to gestural suggestions of subject matter. “Developing a style is not really my thing,” Richardson says, “I like to experiment with different approaches based on how the subject speaks to me.” His working method naturally varies as well. 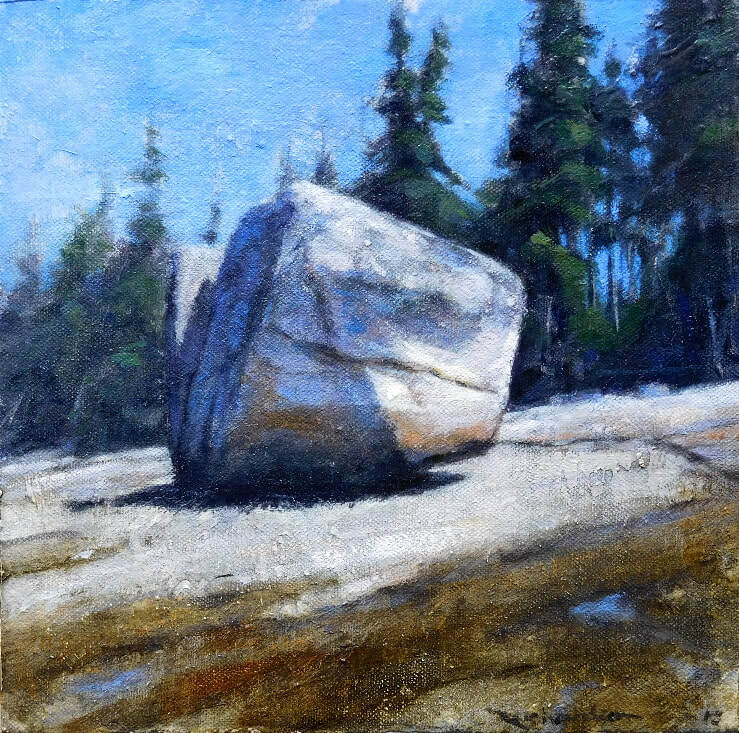 Whether painting representationally or more abstractly, the artist’s source material may include field studies in watercolor or graphite, photographs, or quickly executed oil paintings on paper. 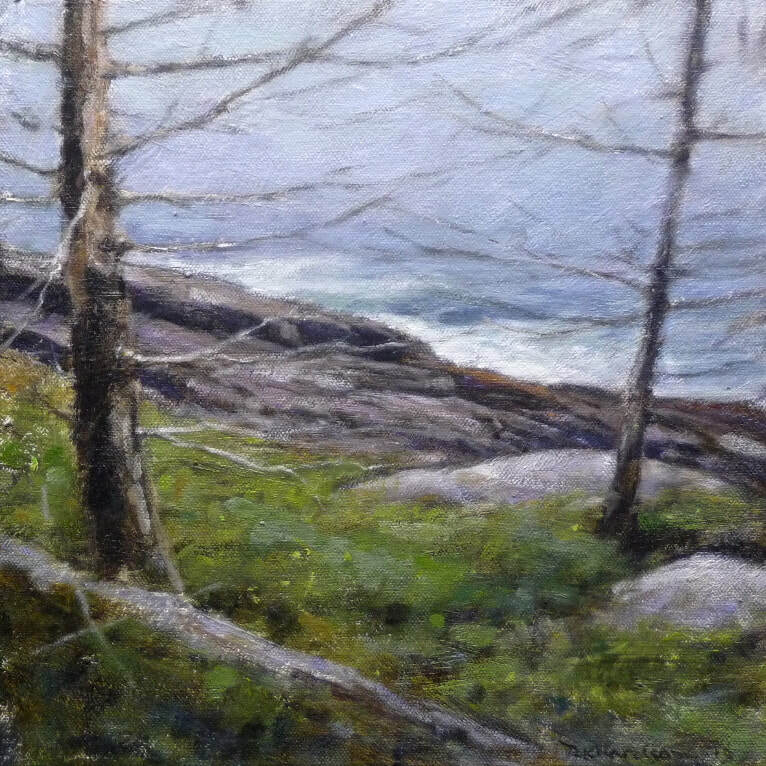 In Richardson’s more loosely painted images of coastal scenes, of which Moment is one, the artist is not interested in the site’s physical particulars but what he calls the energy of a place. Because of the painting’s small scale, some of the sweeping, broad brushstrokes that build up the image appear almost monumental.Moment’s overarching dark palette supports a unifying mood and atmosphere, and Richardson acknowledges the tonalism of George Inness (1825–1894) as an influence. The painting was inspired by a view of Ringtown Island from Marshall Island in Penobscot Bay. “I thought there was a wonderful communication between the islands with the erratic acting as a go-between—it is full of spirit,” says the artist. Paying attention to the edges of things, how they interact, is one studio lesson Richardson has clearly absorbed well.